Is that blasted bra bulge giving you a heavy heart each time you put on your brassiere and a tight tee? You’re not alone because millions of women of varying cup sizes suffer from the same fate each time. Doing cardiovascular exercises like step aerobics, jogging, swimming and playing badminton that melt off fat helps zap that bra bulge. Working out the muscles in the area is also crucial. This can be the challenging part because that particular area where bra bulge occurs is a meeting place of various muscles — those of the shoulder, upper arms and upper back. Continue reading to know some of the best moves to target the right muscles so you can bid bra bulge goodbye. For this bra bulge-blasting exercise, you need an incline bench and a pair of light dumbbells. Lie on your back on an incline bench and hold a dumbbell in each hand. Stretch your arms to the ceiling with both palms facing each other. Part your arms and take each one out to your sides, keeping them straight at all times. You should feel the muscles of your chest, shoulder and upper arms gently stretch. Go back to the starting position. Do 2 sets, each set consisting of 12 repetitions. This is another wonderful exercise for that bra bulge. Also, you need all the props you have used doing the routine above. Grab a pair of light dumbbells and lie on your back on an incline bench. Stretch your arms towards the ceiling, both palms facing one another. 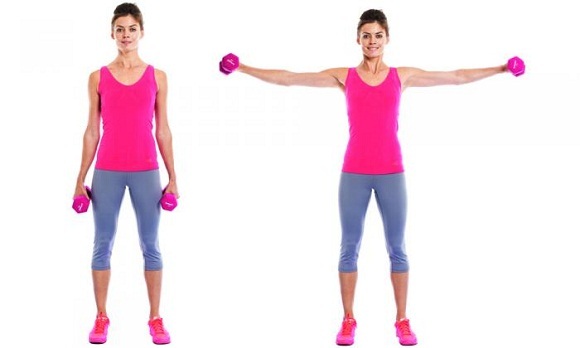 Bend your elbows and lower the dumbbells close to your shoulders while turning your palms facing your lower body. Push the dumbbells back to the starting position. Do a couple of sets of 12 repetitions. Get started by doing a straight-arm plank position, which means your upper body is supported by your arms and palms, not your elbows. The balls of your feet should be planted on the ground. Bend your right knee and take it close to your chest. Place the balls of your feet on the floor. Jump and simultaneously straighten your right leg to take it back to the starting position and bend your left leg to take your left knee to your chest. Repeat everything for 30 to 60 seconds. This exercise for zapping that bra bulge requires you to assume the same starting position as the above routine. Lift your left arm and stretch it to your left side at about shoulder height. Slowly take it back to the starting position then stretch your right arm towards your right side. Repeat everything until you have stretched each of your arms 10 times. Doing this exercise not only helps zap bra bulge, but also tone your core muscles. Grab a pair of light dumbbells or kettle bells. Stand with your legs about shoulder-width apart, with both your knees slightly bent. Bend your hips until it nearly forms a 90-degree angle with your upper body. Allow your arms to dangle in front of you and keep your back straight. Turn your palms towards you and slightly bend your elbows. Lift the dumbbells or kettle bells until they are about chest-level. Slowly take your arms to the starting position. Do 2 sets of 10 to 12 repetitions.